Note: Portions of this article have previously been published in the International Banknote Journal, Vol. 30, No. 4, 1991, Vol. 33, No. 2, 1994, and Volume 40, No.1, 2001. I have written numerous articles reporting on the use of banknotes as a powerful tool of psychological operations (PSYOP). Banknotes have always been a popular medium for propaganda messages since they immediately attract the eye and finders will almost always pick them up off the ground. It is a way for the propagandist to be sure that his message will be read. In addition, banknote propaganda can be easily hidden in a wallet to be read or used at a later and more convenient time. The United States PSYOP effort in Operation Desert Shield and Desert Storm made great use of banknote propaganda. Currency propaganda has not been used in such numbers since World War II. A few words about the Arabic-English translations. I have seen many translations for the same leaflets and they all differ slightly. I worked closely with a Jordanian master sergeant during the war and he told me that there were many errors in the Arabic text on the coalition leaflets. In some cases he had to guess at the meaning of a word. For the purposes of this article I have combined translations and published the message that I believe is the closest to what the coalition wanted to say. I have made compromises for the sake of clarity. The psychological effect of combat actions can be seen in the heightened morale of a successful unit and fear of a defeated unit. 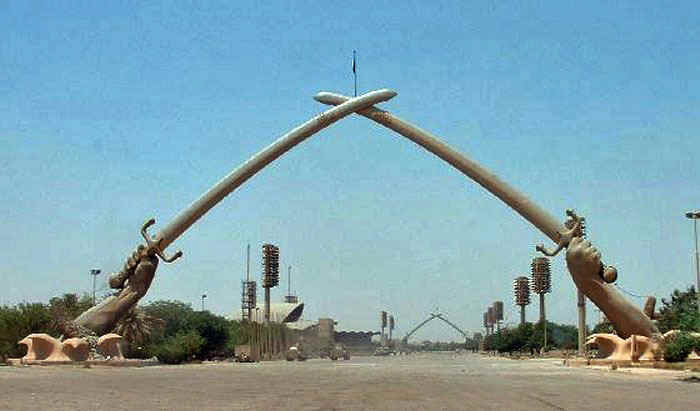 On 2 August 1990, Iraqi forces invaded Kuwait and quickly conquered and occupied the tiny nation. On 8 August Iraq declared the annexation of Kuwait. The Kuwaiti government-in-exile fled to Saudi Arabia where it was recognized as the legitimate voice of Kuwait. Overwhelming disapproval of Iraqs actions led the United Nations Security Council to authorize the use of a coalition of allied troops to protect Saudi Arabia and other Persian Gulf countries, and to liberate Kuwait. A six-week air campaign called Operation Desert Shield destroyed Iraqs military capabilities and destroyed the morale of the frontline Iraqi troops. On 24 February 1991, Operation Desert Storm commenced and Coalition ground forces attacked Iraq, overwhelmingly defeated them, and caused them to retreat under fire back to Iraq. By 26 February, the Iraqi forces were beaten and sued for peace. President George Bush called a halt to the UN Coalition advance on 27 February after a 100-hour ground war. 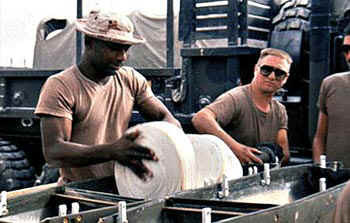 The coalition forces disseminated approximately 29 million leaflets during the Gulf War. A decision was made that no Iraqi soldier would be able to rest or sleep through the night without hearing the sound of coalition aircraft. The plan was to dispatch aircraft over Iraqi defensive positions every three hours, often accompanied by a leaflet drop. There were just a little over 100 different aerial propaganda leaflets dropped on the Iraqis during the Gulf War. The most common variety or theme was the banknote leaflet. Four types were prepared and disseminated by U.S. PSYOP forces stationed in Saudi Arabia. Meanwhile, U.S. PSYOP forces stationed in Turkey dropped an additional six different types. Finally, another six types were distributed that are rumored to be from the Central Intelligence Agency or some other clandestine organization. We dont know who printed them, but we do know that the U.S. Army takes no credit for their production in official military records of the war. Some of the pertinent facts about the PSYOP war were part of the 4th PSYOP Group official slide briefing entitled PSYCHOLOGICAL OPERATIONS IN DESERT SHIELD/DESERT STORM. 29 million leaflets (29 tons) dropped in Kuwaiti Theater of Operations by balloon, MC-130, F-16, F/-18, and B-52. The basic leaflet themes were surrender (12.4 million), inevitability of defeat (6.6 million), abandon equipment and flee(1.9 million), Saddam is to blame (4.7), and other (3.5 million). 98% of enemy prisoners of war interviewed had seen Coalition leaflets. 88% believed the leaflet message. 70% said that the leaflet message influenced their decision to defect. The banknote parodies prepared in Saudi Arabia were produced by the Psychological Operations Dissemination Battalion (Airborne) Print Company of the 4th Psychological Operations (PSYOP) Group, working with the Central Command (CENTCOM) headquartered in Riyadh, Saudi Arabia. The parodies were purposely blurred at the urging of the Saudi government, which was uncomfortable with the thought of producing high-quality forgeries of bank notes. In fact, Saudi concerns may have caused the cancellation of the operation after only very small quantities of leaflets were dropped during the first two days of the ground war. There is a personal anecdote about these banknotes that always amused me and pointed out how easy it is to misunderstand an item. During Desert Storm I was sitting on a footlocker with a PSYOP Captain discussing the Coalition leaflets and he mentioned the blurry notes. I assumed he was talking about all the printing errors and miss-registrations among the notes made in Turkey. We talked for a few minutes and could not quite come to an agreement. I thought I understood him and he thought he understood me. He said they were about the same size as regular Iraqi notes and I said they were smaller. Then a little light went on over my head and I realized he was talking about the four banknote leaflets made in Saudi Arabia and I was talking about the six made in Turkey. The lesson: listen more carefully and dont assume you know what someone else is talking about. Some of the notes made in Turkey were blurry. All of the notes made in Saudi Arabia were blurry. Listen harder! Richard Johnson says in Seeds of Victory  Psychological Warfare and Propaganda that none of the blurry leaflets were disseminated due to Saudi worries about taking part in a counterfeiting scheme. Whatever the truth, a second PSYOP unit operating in Turkey, which had been preparing another set of propaganda parodies of the 25 dinars note, was not told of the Saudi concerns. They dropped large quantities of their banknote leaflets on Iraqi forces. 25 Dinar Note: The intention of this leaflet was not to counterfeit Iraqi monies but to entice the population to read the message on the other side. This was printed as the first four-color process product. 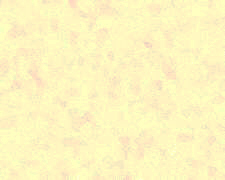 The technique uses the four primary inks CYAN, MAGENTA, YELLOW and BLACK and is printed in a small dot patterns to create an infinite variety of colors. As PSYOP product became more complex, the use of this color printing process became more prevalent. Color separations were manufactured by a new piece of technology, the PSYOP Analyst Terminal (P.A.T.) system. Type 1. "Saddam lives in luxury while you and your family starve." Type 2. "Saddam has made your money worthless while he hoards gold." Type 3. "No amount of money will buy back your honor." been stained by the blood of decent Arabs." At the same time, the United States PSYOP forces in Turkey were printing banknote leaflets. Once again the fronts are imitations of the Iraq 25 dinars Central Bank of Iraq note of 1986. Text on back is in Arabic except where noted. The serial number in Arabic is 0473385. The parodies measure 164x73 mm, whereas the genuine notes measure 178x81 mm. The Hussein watermark is indistinct in the parodies. There are 6 leaflets in the series, assigned code numbers beginning with "A0"; the code numbers do not appear on the leaflets. I have carried you for 11 years. I have no strength to carry you anymore. A crow sits on a sign in the cartoon that reads "Kuwait." The crow is a sign of bad luck in the region. When my Jordanian colleague read the text he started to sing and told me that the words were from an old Arab love song. An important variety exists in which the text on the cartoon was omitted. During the war many of us were on the watch for interesting banknote errors. The above note missing black text is probably the most interesting error of all. 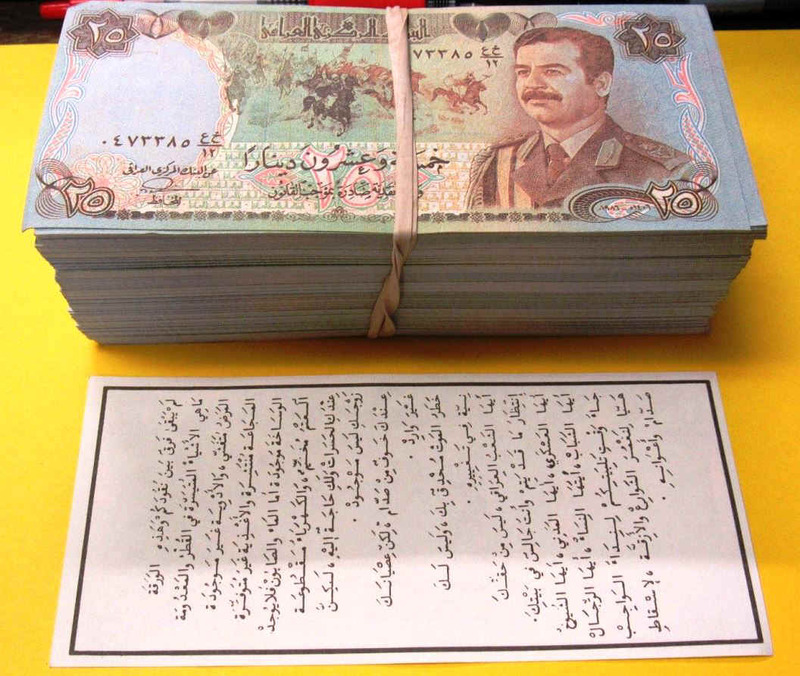 Among others are banknote leaflets with blank back, paper cutting errors, misregistration of colors, greenish or brownish tint, with a "pimple" on Saddam's nose, or a blue streak across Saddam's face. Saddams daily ration for you is ? The daily ration for coalition soldiers is: Breakfast: eggs, bread with butter, meat, two fruits, juice, milk, coffee, and tea. Lunch: meat, beans or potatoes, biscuits with cheese, candy, juice, and coffee. Dinner: meat, bread with butter, vegetables, cake, milk, juice, coffee, and tea. Prisoners are fed the same meal as coalition soldiers. SAFE CONDUCT PASS. You do not have to die. You can be safe and return to your family and loved ones if you cease resistance. You must follow these steps strictly: 1: Remove the magazine from your weapon. 2: Sling your weapon over your left shoulder with the muzzle down. 3: Raise your arms above your head. 4: Approach positions slowly. Hold this pass in your hand above your head. If you do this, you will not die. You will be treated well and someday return to your family. NOTE: Beware of mine fields along the border. The Iraqi soldiers that carry this safe conduct pass are using it as a sign of their sincere desire to cease resistance and be removed from the battlefield. They are to be disarmed, to be well treated, to receive food, water, and medical treatment if necessary. Safe Conduct Pass. Commander, Combined Forces. Attention V Corps Soldiers. Saddam is leading you to death and dishonor. Do not obey his orders. If all the tires on your truck are cut, it cannot move. If your tank is mired in the mud, it cannot move into battle. If your weapons cannot fire, you dont have to fight. If your radio does not work, you cannot hear the orders of your leaders. Do not die for Saddam, but live for peace! The Iraqi V Corps was based north of Baghdad along the northern border of Iraq. It consisted of 5 infantry divisions. There is no difference between your money and this piece of paper. Worthless money is plentiful in the land and the deprivation is spreading. No remedy is in sight. The suffering is spreading. There is no nourishment, but there is filth. There is no water or soap to be found. The darkness has settled. The electricity is out. You are in distress. You have needs but your wife is not with you. You are afraid of Saddam but you do not disobey. You are in imminent danger of death but have no plan to change it. Oh people of Iraq, you still have the power to do something but you are sitting in your houses. Oh soldiers, Oh civilians, Oh elders, Oh youth, Oh women, Oh men! The time has come for you to respond to the call of duty. Rise up and flood the streets and alleys for the overthrow of Saddam and supporters. The money of Iraq has no value. There is no food, no peace, no happiness in Iraq. There is thirst, there is hunger, there is misery, and there is death in Iraq. Saddam is responsible for all this misery! Act against Saddam now! His fall is inevitable. The Joint Task Force Proven Force product book entitled VAN KEDISI - DESERT STORM depicts a number of the leaflets prepared in Turkey and gives their Coalition internal code numbers. The currency leaflet "The money of Iraq has no value" is coded A022A. The leaflet "There is no difference in value..." is coded A022B. Planes from Incirlik Air Base drop millions of leaflets which had "dinar" on one side. U.S.A. POURS MONEY ON IRAQ! They are conducting propaganda with leaflets that look like money. The leaflets which have been disseminated by the U.S. fighter planes from Incirlik have money on one side and statements on the other and have been very effective. Officials on base say that the leaflets have several statements on the back. I know that after the war there were numerous offers of the six banknote leaflets from Turkey in bulk. One fellow wrote to me and offered me 50 cents each if I would sign individual guarantees that about 10,000 of the leaflets that he had were genuine. I did see those same banknote leaflets later offered on eBay inside faux leather wallets. In 2018, an EBay dealer offered a block of 500 Desert Storm banknotes for $750. Maybe the stories are true and more of the leaflets from Turkey went missing than were dropped on the Iraqis. The final six propaganda banknotes are not acknowledged as 4th PSYOP Group product. It is therefore assumed that they are clandestine products. We call them the United States "black" parodies of Iraq 25 dinars Central Bank of Iraq note of 1986. They were printed in full color on thin, white paper. The fronts show good replicas of the 25-dinar note. The backs show cartoons in black. The parodies measure 152x76 mm, whereas the genuine note measures 178x81 mm. The serial number on all notes is 0342845. However, at his direction (Office of the Director of the Joint Staff) the campaigns and their component actions were divided into two subplans; a "white" (overt) subplan to be executed by the Department of Defense, and a "black" (covert) subplan passed to the CIA as a "recommendation." In fact, few if any of the proposed actions were truly covert. Most of the "non-white" actions involved clandestine delivery of overt US messages through channels not accessible by the United States Commander in Chief, Central Command, e.g., the Kuwaiti resistance. The planning cell assumed the CIA had such access and therefore suggested the agency as an appropriate action agent. The distinction was apparently lost during the review process. These black leaflets are thought to be products of the CIA, which may have used a classified military operation as a cover. The leaflets are quite similar to items known to have been prepared by the 4th PSYOP Group. 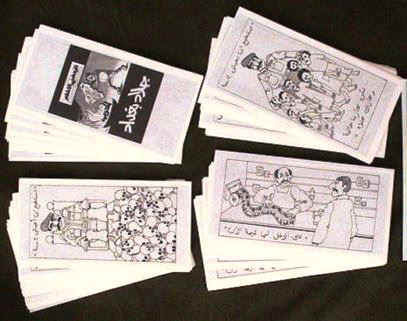 Some sources state that the leaflets were produced as a part of Joint Task Force Proven Force, whose goal was the destabilization of the Saddam regime. A Pentagon report to Congress states that JTF Proven Force was primarily an Air Force effort based in Turkey, under the operational control of EUCOM, but under the tactical control of CENTCOM. JTFPF controlled over 6000 men and large number of aircraft based in Turkey, including B52s used for bombing and leaflet missions. Sources allege that (at least a part of) Proven Force was and is a highly secret special operations force engaged in clandestine activities. Stanley Sandler in Cease Resistance: Its Good For You: A History of the U.S. Army Combat Psychological Operations, 2nd edition, 1999, says that JTFPF contained an ad-hoc 21-person PSYOP detachment who designed and prepared propaganda leaflets and broadcasts that were disseminated by a hastily organized multi-aircraft special Air Force unit designated the 7440th Composite Wing (Provisional). This ad-hoc detachment was probably the 8th PSYOP Task Force (8th POTF), which, according to a veteran who was with the 4th PSYOP Group, was left behind after the majority of U.S. troops left the Gulf. Part of the 8th POTF went to Kuwait to help in the restoration of civil affairs after the liberation; another part worked with the Kurds as part of the "refugee" resettlement. The CIA, not having the capability to print these items, might have given the printing job to one of the contingents of the 8th POTF. The only published reference to these parodies appeared in Newsweek, 8 June 1993, two years after the end of the war. The article, entitled "First: Smart Bombs. Now: Funny Money" says, "Some funny money ridicules the regime with pictures of an empty grocery store or of Saddam chomping on a cigar. Its no smart bomb, but the dinars value is plunging." These notes have been very slow in coming to light. In fact, it is mostly the retirement of former CIA officers who have offered their souvenirs for sale over the past few years that allow us to identify all the banknotes. The first two "CIA notes" discussed below were offered in England in March 1994. I questioned the owner and he said that they had come from an American who said he had received them from a former intelligence operative. A second group appeared in 1999, said to be from the personal collection of a former CIA agent. As the war neared end, U.S. Special Forces encouraged the Kurds in the north and the Shi'ites in the south to rise up against Saddam Hussein. This third banknote campaign could have been part of such a "black" operation. The entire six "CIA" notes were printed on a very thin paper. Such paper is sometimes used by the military because it is lighter, more specimens of a leaflet can be placed in a leaflet bomb or balloon, and the lighter paper also causes the leaflets to disperse in a different pattern. In fact, there were several such leaflets produced by the 4th Group during the war. Some leaflets were printed on both bond and a thin tissue paper. During the Persian Gulf War, copies of this CIA-produced pamphlet were air-dropped over a designated area prior to an Allied bombing run. These leaflets gave the civilian population time to evacuate and military units an opportunity to surrender. I immediately recognized the leaflets as very similar to the 4th Group leaflets and assumed that the CIA was taking credit for an Army PSYOP campaign. When I looked closer, however, I realized that each of the leaflets on display were on a thin tissue-like paper. They were just a bit different from the Army leaflets. These slightly changed leaflets all on thin paper seem to be proof that the CIA probably did print the six mysterious banknotes leaflets. Type 1. The back shows a grinning Saddam sitting atop a pile of skulls. Vertical format. Arabic text in 1 line is "I can live for 20 years." The cartoon of Saddams head can be seen through the watermark area on the front. Type 2. The back shows cartoon of Saddam standing behind seven starving children. Vertical format. 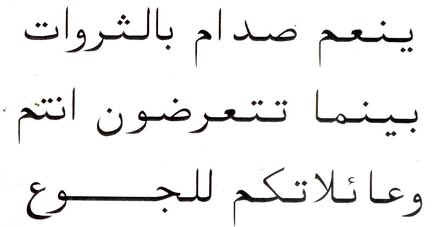 Arabic text in 3 lines is "We can live for 20 years. But our stores are empty and your stores are full." The cartoon of Saddams head can be seen through the watermark area on the front. Type 3. The back shows Saddam lighting a cigar with a map of Kuwait and holding a glass of champagne. Horizontal format. 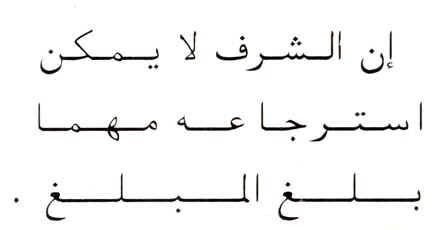 Arabic text in two lines is "I can live for 20 years." Mentioned in Newsweek, 8 June 1992, page 38. Type 4. The back shows a nearly empty grocery store, with only a large roll of Iraqi banknotes printed on wrapping paper. Horizontal format. Arabic text in one line is "At least it has a value now!" Mentioned in Newsweek, 8 June 1992, page 38. Type 5. 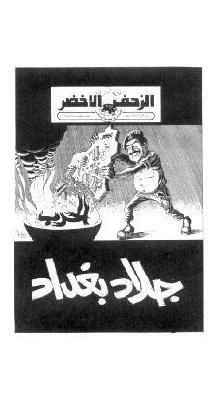 The back shows the front page of an Arabic newspaper The Green March, with black bars at top and bottom framing a cartoon of Saddam throwing Kuwait onto the fires of war. Vertical format. The bottom black bar contains large text "The Butcher of Baghdad." Small text beneath the masthead is "Social Weekly Newspaper produced by the Revolutionary Committee." 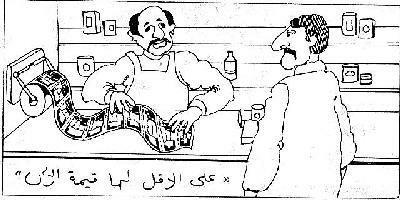 The cartoon is autographed with the date 1986 in Arabic, leading to speculation that the cartoon was published in an earlier newspaper and copied. Type 6. The back shows two Iraqi soldiers sitting on a prayer rug in the desert. In the distant background are some palm trees. The Iraqi at right faces the viewer; the Iraqi on the left is shown in profile and faces the one at right. Both soldiers hold glasses of tea. Two lines of Arabic text in the center ask: "Have you heard what Radis father has agreed to?" I suspect that Radi is a nickname for Saddam or perhaps an allusion to the Koran, but I have never been able to get an acceptable answer to the meaning of this text. 25 years after the end of the Operation Desert Storm Richard Johnson offered four of the CIA banknote leaflets for a price of $85. He added a photograph to the offer that indicates that he had saved at least a dozen of each of the banknote leaflets. Kaufman's has meticulously reproduced the original 12 PSYOP propaganda leaflets. We have printed them in exacting detail and send them complete with English translations. 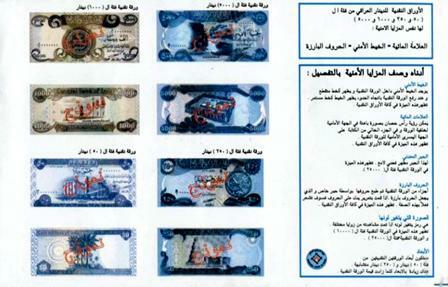 Several of the leaflets share the same front, a full color counterfeit of the 25 Dinar (Iraqi currency) because the Iraqi soldier could be shot for possessing propaganda from the enemy. This way, the soldiers could fold the leaflet in half and it looks like a regular bill. The leaflets are printed on a four-color press and the set is offered at $9.95 plus postage. The Kaufmans fakes have fairly good color rendering on the front, but with background tending toward brownish-green rather than blue. The reproductions measure 173x77 mm, slightly smaller than the genuine notes and considerably larger than the 164x73 mm of the parodies. A spokesman for the firm told me that over 600 sets were sold between May and July of 1991. They are fairly close in color and detail to the original banknote leaflets, except that they are larger, measuring 173x77 mm. Kaufmans also produced "reprints" of several of the non-currency leaflets. Several other dealers subsequently offered reproductions similar to Kaufmans, but slightly smaller (162x72 mm) than the genuine leaflet, and with a more purplish cast. Another reproduction of the Iraqi propaganda banknote was made by a firm in Mississippi. They got the colors mostly right, but the watermark area to the left is not quite as blue and Saddams face is a bit browner. You can also see some of the text on the back of the note in the clear watermark area at the left, probably a sign of a slightly thinner paper. The size is a bit off measuring just 163 x 72 mm. print counterfeit Iraqi currency, which was then distributed to Kurdish leaders, who flooded the market with worthless bills. Unfortunately, like so many pieces of information my colleagues and I came across in the course of reporting on the Gulf War, we were unable to develop more than the barest outlines of an operation codenamed "Blink Saddam Blink." We were told that the operation did involve the infiltration of counterfeit Iraqi currency into the country, but we were singularly unsuccessful in learning more about it. Can a blizzard of banknotes succeed where Desert Storm failed? Some of those still working to topple Saddam Hussein evidently think its worth a try. In a campaign Iraq denounces as a CIA plot called "Laundry," counterfeit Iraqi and U.S. dollars are flooding into the country across all of its borders. 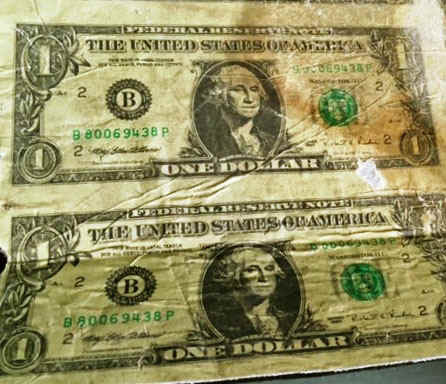 The Iraqis say bales of fake dollar bills have been dumped from American helicopters; U.S. intelligent sources say its an all-Arab operation led by the Saudis. Whoever is at the helm clearly knows his business. Many of the fake dinars can scarcely be distinguished from the poor-quality, blue and orange bills Iraq itself is printing at a furious rate to pay for reconstruction and military raises. Official of the U.S. Central Intelligence Agency are refusing comment on media reports that the agency has placed counterfeit Iraqi money into circulation in Iraq in an attempt to disrupt the economy and government. The undercover operation in Iraq is called "Operation Laundry." CIA media spokesman Mark Mansfield told Coin World "It is not our policy to comment on such allegations." The highly respected London newspaper The Sunday Telegraph says that the CIA is quietly flooding Iraq with counterfeit money, especially, it is believed, 5, 25 and 50 dinar notes in an attempt to destabilize Saddam Hussein's government by making the money worth next to nothing. Iraq's economy is the target of an American-led destabilization campaign to pour vast amounts of counterfeit currency into the country. The (Arab) officials, who insisted on not being identified, said the countries behind the separate counterfeiting operation included western nations, Saudi Arabia, Iran and Israel. "People joke about it and some have become experts in telling which denominations are printed in Israel, the United States or in Saudi Arabia", said an Iraqi who insisted on not being identified. A Saudi official, who insisted on not being identified said, "All borders are being used." Since no official is willing to be identified and every enemy of Iraq is mentioned as a possible counterfeiter, one might suspect that the Iraqi complaints are meant to explain away a corrupt system, internal counterfeiting of poorly made banknotes produced in Iraq, and a failing economy. Twenty years after the war there was still debate about the counterfeiting of Iraqi currency. One researcher told me in 2010 that there was an unverified report that the counterfeits were made in Beirut, Lebanon, and transported to Saudi Arabia from where they were smuggled by Kuwaitis back into occupied Kuwait. This is not exactly propaganda as we usually think about it, unless you consider walking on an enemy's banknotes propaganda. This section has to do with a carpet that was probably a gift given to Saddam that was made up of counterfeit U.S. banknotes. How do we know they are counterfeit? They all have the same serial number: B80069438P. An Iraqi security officer at the site told me through my interpreter that Saddam later incorporated a carpet of American one dollar bills to be tread on by his troops and sent me away with a great souvenir [the two notes above attached to a thick cloth]. A second soldier stated that he had a piece that was two bills deep and about two feet wide. Apparently the carpet had been cut up into hundreds of collectible pieces. I know this rug quite well. It comes from the parade ground; specifically, under the stands and behind the Presidential box. This was a fairly large series of rooms that contained art, poetry, ceramics, statues and even all of the plastic flowers that you would see young girls presenting Saddam at official appearances and in propaganda photos. There you will find The Museum of Present's to the President. The entire floor was covered in this carpet. Curiously, while the United States might have been trying to counterfeit Iraqi currency during Desert Storm, the tides were turned in Operation Iraqi Freedom. After the invasion of Iraq in 2003 and the eventual fail of Saddam, the United States wanted to protect the new banknotes of the more democratic government. Above, an Iraqi soldier from the 14th Iraqi Division and U.S. Army Staff Sergeant Adam Vinglas of the 305th PSYOP Company speak with a local cash exchange businessman about counterfeit money in the local community during a joint foot patrol in Basra, Iraq, in 2009. An Iraqi officer tests the chemical composition of both real and fake currency during an anti-counterfeiting class being taught in 2010 by the 3212 Tactical PSYOP Detachment, 318th PSYOP Company, 8th PSYOP Battalion. During their invasion of Kuwait, Iraqi forces looted Kuwaiti banks and stole billions of dollars in Kuwaiti banknotes. During the invasion, the banks and their money were at the mercy of Iraqi forces. They made the Iraqi dinar the official currency at the exchange rate of one-to-one, though the real value of the Iraqi dinar was one tenth of the Kuwaiti dinar. The Iraqis stole all assets and funds in the vault of the man commercial banks and their branches. The Central Bank lost all its contents, including gold reserves totaling 1.3 billion ounces. Also taken to Iraq were gold and silver souvenir coins and bonds worth an estimated 484 million. Brand new banknotes worth 1.152 billion were also taken to Iraq. The Iraqi invasion severely disrupted the banking system and also caused international distrust of Kuwaits currency right from the start of the occupation. After the Gulf War, Kuwait replaced its currency with the 1992 Post Liberation Issue, and declared all previous note issues worthless. Although the stolen notes were not used in propaganda, we list them for reference. The Iraqis stole notes in the denomination of 1/4 Dinar, 1/2 Dinar, 1 Dinar, 5 Dinars, 10 Dinars, and 20 Dinars. When the Iraqi soldiers stormed across the desert borders into Kuwait, one of the first places they broke into was the Central Bank. Large quantities of notes were looted from the vaults. Later, British armed forces units on active service "relieved" captured Iraqi soldiers of their spoils of war.When hostilities ceased, all these notes were collected by the Ministry of Defence's Central Cash Management branch and presented for payment at the National Bank of Kuwait. But the Kuwaiti government refused payment because the notes had been stolen and overprinted them with a purple handstamp to this effect. It is estimated that more than 2 billion worth of gold and negotiable paper money were stolen by Iraq. The serial numbers on all stolen notes were identified and publicly announced. The British 1st Armored Division was a vital part of the Coalition forced during the Persian Gulf War. During the attack into Iraq, and the dash across Kuwait north of Kuwait City, they overran and occupied a number of Iraqi headquarters and military installations. They advanced 290 kilometers, destroyed three Iraqi divisions, and captured or destroyed more than four thousand Iraqi tanks and armored vehicles. They captured several millions of dollars in Iraqi currency. The banknotes were returned to England where the Ministry of Defense Cash Management Branch stamped the front of each note with the words, "MINISTRY OF DEFENCE" and "CERTIFIED OFFICIAL." Take the necessary measures, watch those acts, hit ruthlessly at such people and keep us informed. This sort of exchange of currency is quite common in military theaters during wartime. During the Vietnam War, the U.S. Government would routinely exchange old Military Payment certificates (MPC) in order the attack the local black market and those that had illegally hoarded the currency. Are there still millions of dollars in the old Kuwaiti banknotes floating around the Mideast? Perhaps! In 2011, I received information that there is a huge quantity of old Kuwaiti dinars available in the United Arabs Emirates. The source suspected that the old dinars could be those stolen by Iraq during the occupation. He felt that buying such notes was most likely illegal; there would be no way to trade or exchange any of the notes through the Central Bank of Kuwait and it would be a worthless and dangerous proposition to be involved with. He asked my opinion. I was short and to the point. I am not an expert. But I know that the serial numbers of all the stolen currency is recorded and the money is invalid. It has no value. On the 26th of February 1991, the sovereignty of the State of Kuwait was restored and the people of Kuwait were freed from the tyrannical occupation. Thereby, the legitimate government has resumed its duties toward the reconstruction, progress and prosperity of the country. This special note has been issued to express gratitude and appreciation for the sacrifices and support, which culminated in the liberation of Kuwait. The note also serves as a reminder of the devastation inflicted on Kuwait under occupation, in particular, the human suffering and the environmental tragedy. The front of the one dinar note depicts a map of Kuwait and lists all the countries that took part in the coalition. The back depicts the liberation and burning oil wells. The Tenth Liberation Day - like all other liberation days - also reminds us of the strong perseverance and will evidenced by us during the treacherous Iraqi occupation, and of the sublime manifestation of sacrifice made by our martyrs, whose blood was shed for their dear homeland. On the occasion of our liberation, we shall not forget to commend all effective assistance and support offered from the peoples and governments of 34 brotherly and friendly countries, and international organizations as well. We shall always pray to Allah the Almighty for protection for Kuwait against all adversity, for compassion for our martyrs and the prompt release of our Prisoners of War. On 5 March 2016 the Central Bank of Kuwait announced two new coins to mark the 25th anniversary of the nations liberation following Operation Desert Storm. A silver 5-dinar coin and a gold-plated silver 5-dinar coin mark the Feb. 26 anniversary of liberation. The coins went on sale at the bank office, with the silver coin costing about $116 in U.S. funds and the gold-plated version available for about $153 U.S. The front of commemorative coins marking the Silver Jubilee of Liberation Day carries the date of the occasion in both Arabic and English, the inscription The Twenty Fifth Anniversary of Liberation of the State of Kuwait in Arabic, circular decorative assortments, the States Official Logo and portraits of a Kuwait soldier giving the military salute and a tank. There is one last leaflet that should be mentioned in an article on the subject of banknotes. After the invasion of Iraq by the Coalition forces and the fall of the government of Saddam Hussein, the old currency was invalid. The occupying powers, working with selected individuals within Iraq and the Central Bank of Iraq designed a new series of Post-Saddam banknotes. 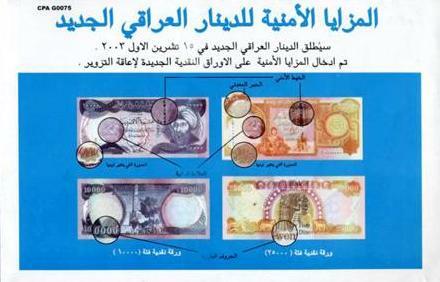 The Coalition printed a leaflet that depicted the various banknotes and explained the features that the Iraqi people should look for to be assured that the currency was legitimate and genuine. The leaflet was coded CPA G0075 and printed in full color. The use of banknotes as a medium for propaganda has always been popular. Cash on the ground will catch the eye much quicker than a standard propaganda leaflet. People will pick up banknotes and often read the text almost before realizing that they hold propaganda and not a gift from Heaven. The author is always interested in hearing personal anecdotes about the use of such items. Interested readers, or those with comments or corrections to this story are encouraged to write to sgmbert@hotmail.com.